Flamefrost Legacy brings to your computer an epic RPG experience. Inspired by the d20 system and developed by an indie team Epic Dragon thanks to crowdfunding. 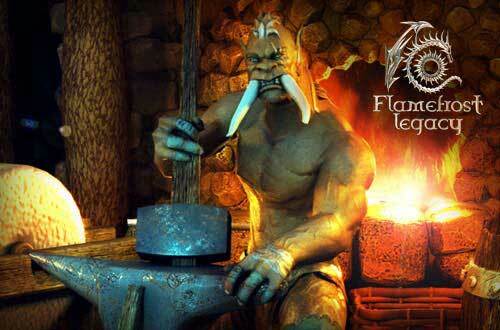 In Flamefrost Legacy the player can choose between 3 races, the half-dragons Tul’Rhax, dwarfs and, of course, humans. Also there are 3 classes available, mage, warrior and rogue. FlameFrost is a free to play isometric turn-based MMORPG that can be played directly in your browser, inspired by the table-top game “Dungeons & Dragons”, as well as a number of old-school RPGs (such as “Icewind Dale” and “Baldur’s Gate”). Explore the world map at your own pace, find new places, missions and enemies. Your character stats improve depending on what skills you are using, so for example you can improve your swordsmanship skill simply by using a sword during combat. You can enjoy the DnD system of Flamefrost Legacy anywhere, as this game doesn’t require any installation. So be prepared to throw fireballs on any device and wherever you are! Thẻ đồ họa: Intel / ATI Radeon X850, 256 MB or better. DirectX 9.0 or higher. Thẻ đồ họa: nVIDIA GeForce 6800 / ATI Radeon X850, 256 MB or better. DirectX 9.0 or higher.